Chemically it is an aromatic heterocycle di-N-oxide. 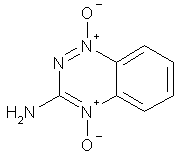 Its full chemical name is 3-amino-1,2,4-benzotriazine-1,4 dioxide. Originally it was prepared in a programme screening for new herbicides in 1972. Its clinical use was first described by Zeman et al in 1986.